Due to Hollidays we need to pospone the final product distribution for the begining of the 2014. The boards are ready, and a couple of them will be assembled manualy for testing and verification. The rest of them are waiting for a pick&place "hands". I would like to thanks to all of you who show your interest for this gadget. 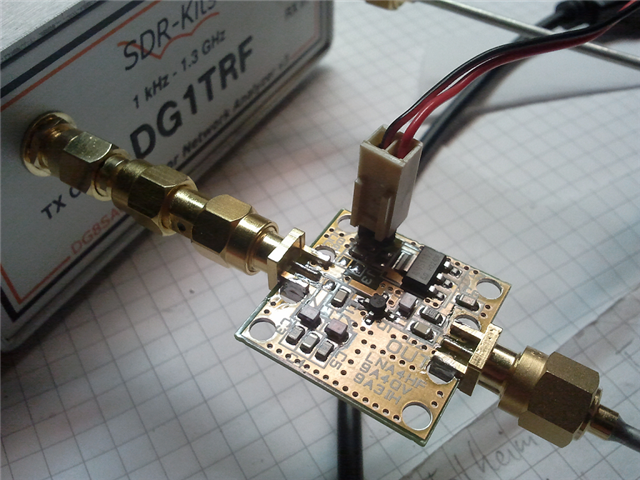 I expect to have the LNA4HF ready for the shipping before the end of the year. Speaking about the shipping, all of you who help, up today, with your comments and ideas here on the page or directly sending the e-mail will have a free shipping on LNA4HF orders, as a season gift from our side. 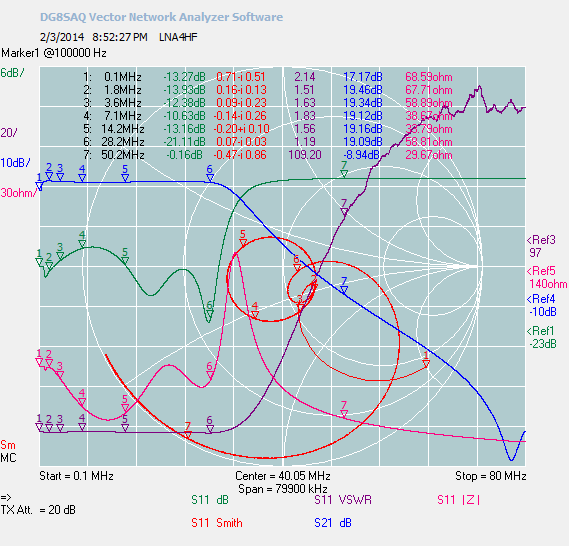 The final concept deliver 18-20dB of the gain through the range from 150khz up to 30MHz. So all the long and medium wave fans will also benefit from this gadget. Power supply, anything from 6-12V DC. 5V supply is option ready. 5 pole low pass filter at the input, with option to bypass the filter with a simple modification. Beside that, the PCB only will be available where somebody can build the amplifier they want using various MMIC-s. 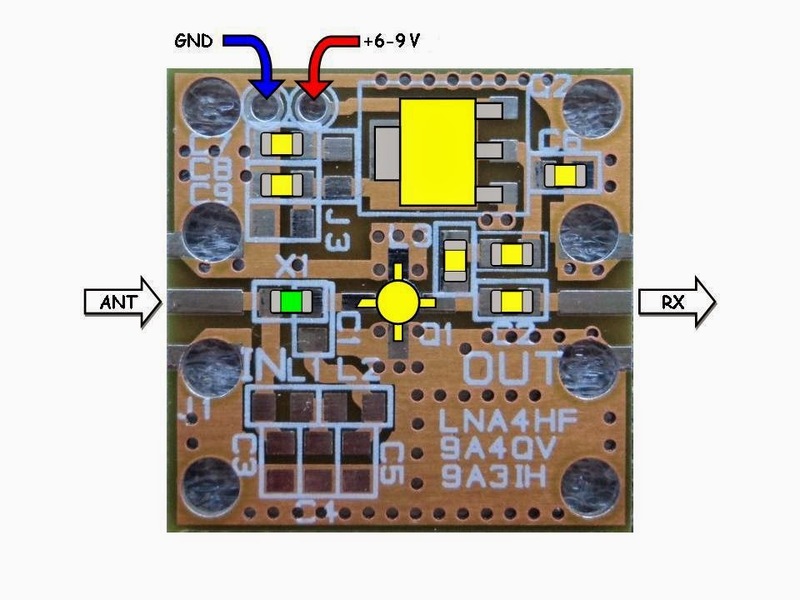 So the PCB is a kind of universal MMIC developing board where not only SOT-86 MMICs can be used but others too. After we stop to make and distribute the Upconverter gadget UP-100 for the DVB-T SDR dongle we start to receive the e-mails asking to help to improve the performance of the present Upconverters that can be found on the market that are not our products. We decide to design this gadget to help all this guys suffering the weak reception on the HF using various upconverters. So here it is, LNA for HF. This small gadget can improve your reception by amplifying the HF frequencies in range from 150 kHz - 30 MHz by 19 dB. Up to now we make a couple of such amplifiers (without LP filter) on request but due to increased interest we decide to improve the already good design. The same LNA board accommodate now also the 5 pole low pass 30 MHz cutoff filter at the input together with the active MMIC device, all on the small PCB measuring only 1" square (25x25mm). 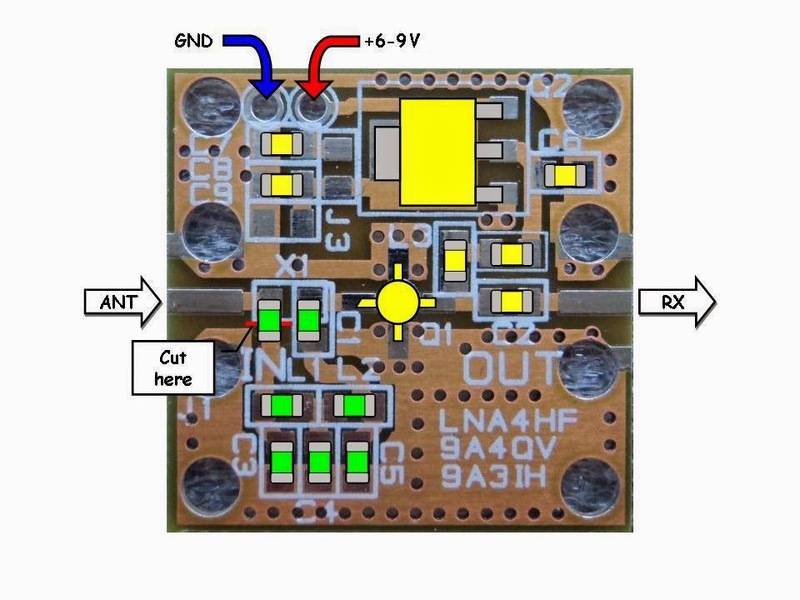 The board can be powered from 6-12 VDC but there is possibility to power the board also with the 5 VDC from the already existing 5 V that you have on the upconverter. The consumption is only 19mA which should not create any problems for any regulator you have installed there. SMA connectors on the input and the output became a "standard" with this gadgets so only one extra SMA male/male jumper cable is required or SMA male/male adapter and that's it. 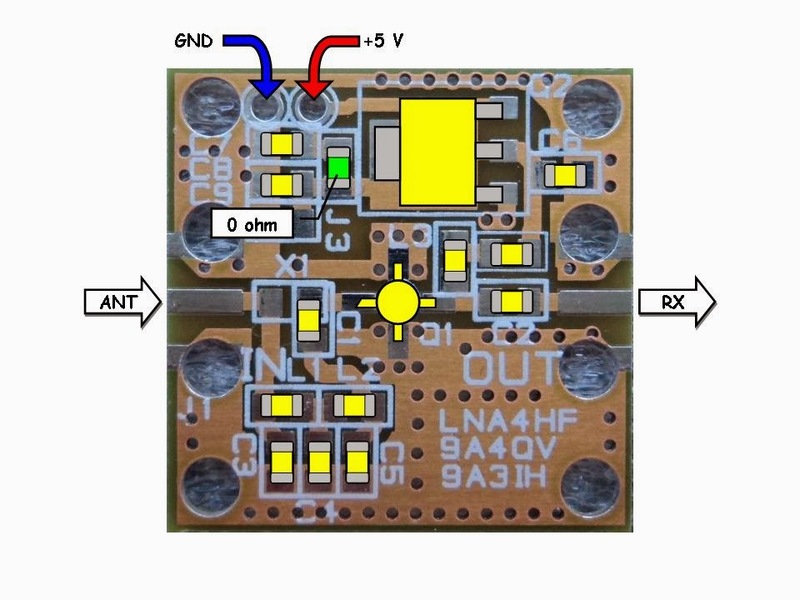 This is just a working prototype made on the LNA4ALL PCB to check the performance of the filter and the amplifier. This is not a finished product. So I need your opinion and according to the interest we can produce a batch of the amplifiers. 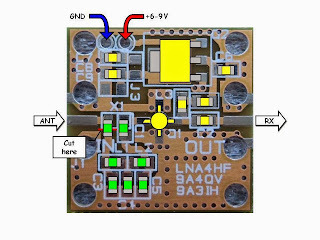 The target price is 20 Euro for the assembled and tested LNA together with the SMA connectors on board. There is an option to have also the LNA for the HF without the low pass filter at the input for all those who wish to use the same LNA also higher up to 1 GHz. 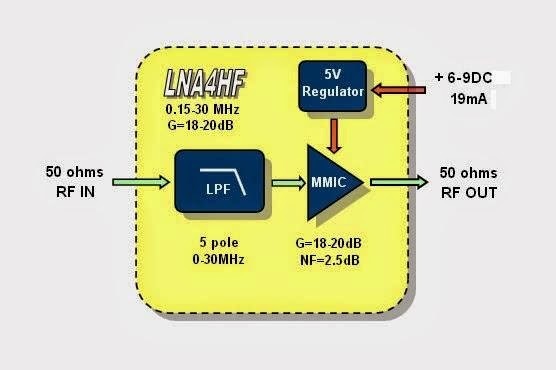 The gain of the LNA without filters is around 18-20dB up to 1GHz and NF up to 2.5dB. This is how you should connect the LNA4HF together with the existing Upconverter and DVB-T dongle. I have comments opened for you to see how many interest there will be for a product where you can state your ideas about the price, filters, power supply etc. If we receive the interest for at least 50 LNA4HF we will make a batch of 100-150 pcs. 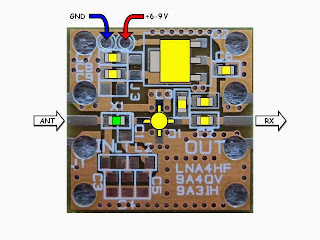 The quality of the product should be the same as the LNA4ALL or UP-100 and up to now we did not have complains on the quality and design of the PCB. 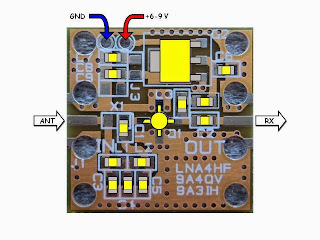 Of course, we plan to offer just a PCB for the guys wish to design their own LNA with the MMIC they like and the filter they want. The same board can accommodate several MMIC types. 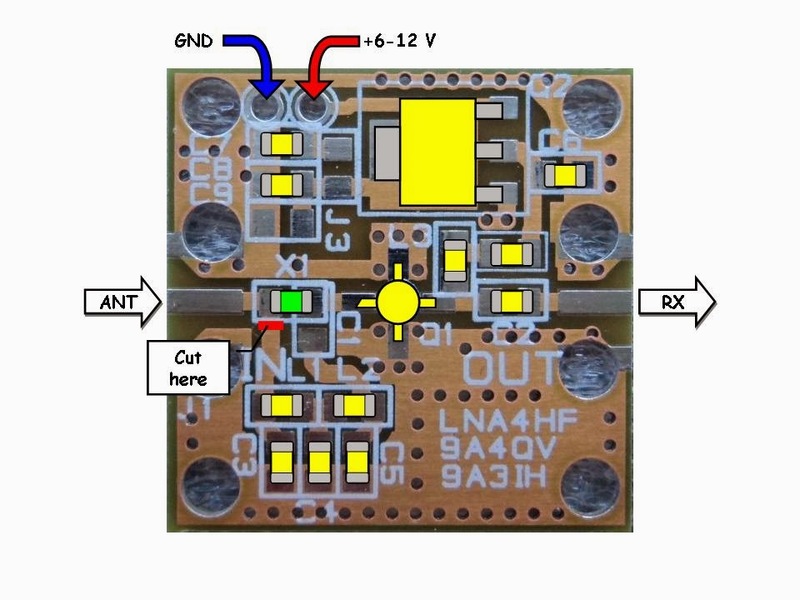 If you need the LNA4HF let us know, the comments are open for discussion.